No other material offers the character and craftsmanship of KOHLER Cast Iron. Each piece embodies our commitment to crafting the finest sinks and baths for over 100 years. Built to last for generations, KOHLER Cast Iron makes an enduring statement of beauty in your home with strength, style and passion. Crafted with exquisite workmanship and advanced technology, each piece of KOHLER cast iron embodies our commitment to crafting the finest for over 130 years. Thick, durable and easy-to-clean enamel surface stands the test of time. Utilizing 93% recyclable materials, lead-free KOHLER® Cast Iron safeguards your health and the environment. KOHLER warrants the cast iron components to be free of defects in material and workmanship for a lifetime of normal use. In its more than 130 years of iron casting history, KOHLLER has stuck to the most traditional way of glazing — by hand, because it’s our firm belief that every cast iron product made by KOHLER constitutes an artifact. Only when made by our most experienced craftsmen can the spirit of casting iron be passed down to later generations. In 1883, John Michael Kohler applied enamel to a cast iron horse trough to create the company's first bathtub, which marked the beginning of the plumbing fixture industry. 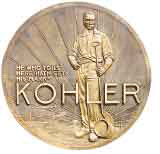 In 1998, Kohler established a sole-proprietorship factory to cater to consumers’ demand for fixtures. Every Kohler factory strictly conforms to the globally unified quality standard. KOHLER cast iron products possess thicker enamel surfaces than their counterparts. They can withstand the test of the time and remain polished. The surface is mirror-smooth, easy to wash and suitable for any kitchen environment. KOHLER enamel is four times thicker than on a heavy-gauge steel bath. The cast iron is three times thicker than a heavy-gauge steel bath. Available in an extensive array of colors. The sheen and glossy surface of KOHLER Cast Iron exceeds that of the KOHLER heavy-gauge steel bath by 15%. Fired at temperatures 100 degrees higher than a heavy-gauge steel bath. Offers 2.5 times better protection against slipping than a heavy-gauge steel bath. Offers 5 times better heat-retention than a heavy-gauge steel bath. 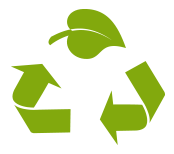 Utilizing 93% recyclable materials, lead-free KOHLER cast iron safeguards your health and the environment. 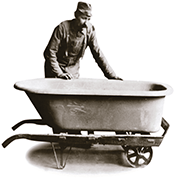 KOHLER cast iron bathtubs have SEPA certification (the highest standard certification for environmental protection). 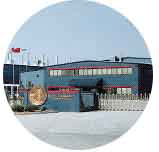 The Kohler factory in Shanghai obtains certifications based on the highest standard in every country and has taken the lead in obtaining the permit to export to multiple countries. You can see the KOHLER cast iron series in a majority of five-star hotels worldwide.